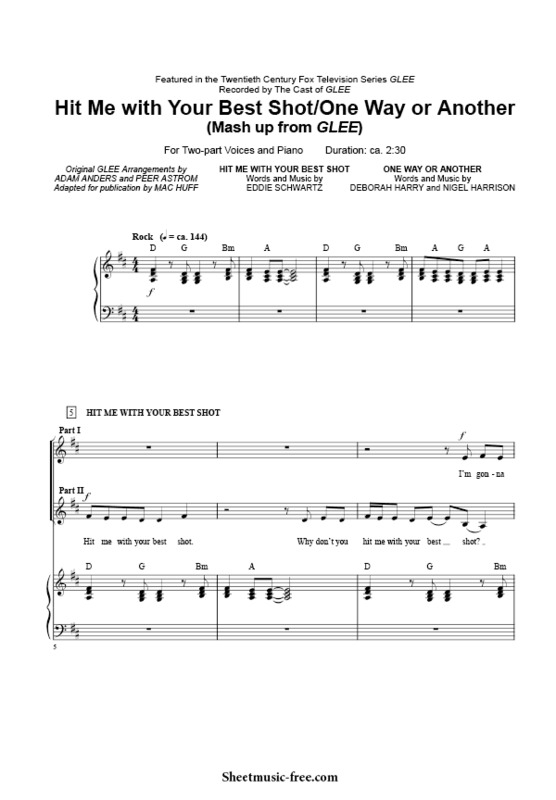 “Hit Me With Your Best Shot Sheet Music” from Glee, “ Hit Me With Your Best Shot Sheet Music” for Piano / Vocal/ Chords , Original key: D Major, number of pages sheet music PDF: 10, Video and Lyrics song Hit Me With Your Best Shot Sheet Music. “Hit Me With Your Best Shot’” Hit Me with Your Best Shot/One Way or Another by Pat Benatar/Blondie is a mash-up featured in Mash Off, the sixth episode of Season Three. It is sung by the New Directions and the Troubletones, with Finn and Santana singing lead. Hit Me With Your Best Shot Sheet Music Glee.